Shallots look like small, misshapen onions, or huge, bronze coloured garlic cloves. The Cato’s Potatoes stall at the farmers’ market sells them at this time of the year. These interesting members of the onion family can be easily turned into wonderful cold-weather comfort food. Shallots have a more complex flavour than ordinary onions. They’re mild, sweet, with a hint of garlic. They’re a famous x-factor ingredient in French cuisine, often recommended for sauces and gravies. If you don’t shop at the farmers’ market, shallots may be hard to come by. You almost certainly won’t find them in supermarkets, and not in most greengrocers either. They’re not difficult to grow in a home garden. 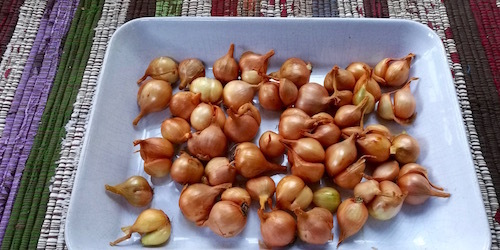 A handful of shallot bulbs will multiply and give you a huge harvest. This is a good time to plant shallots. Traditionally they’re planted on the shortest day and harvested on the longest day. But actually if they are planted any time before spring you’ll get a crop. Each shallot bulb is planted rather like garlic bulbs, with the pointed end up. Give them plenty of space – plant the bulbs at least 15cm apart, in rows 30cm apart. Shallots need more space than garlic because they form clusters of bulbs rather than one head. Like other members of the onion family they grow best in fertile, well drained soil, in full sun. If they get waterlogged they will rot – but they may need watering if there’s a dry spell. You can use shallots in pretty much any recipe that calls for onions. Here are three of my favourite shallot recipes. When you need a small quantity of onion, rather than a whole onion, a shallot is the perfect size. I’d put just one shallot in guacamole, or salsa verde, and salsa rossa, for a mild onion flavour, plus a little hint of garlic as well. Place everything in a blender and whizz together. Add more olive oil if sauce is too thick. This would complement baked vegetables, or a quiche, or a meat dish. It’s plenty for four people. Peel 500g of shallots. This is a bit more fiddly than peeling onions, but easier than peeling garlic. Place them in a roasting dish with a couple of tablespoons of olive oil or melted lard. Toss to make sure the oil coats each shallot. Sprinkle with a small amount of good quality salt, and a grind of black pepper, and 6 sprigs of fresh thyme. Roast in a fairly hot oven (180 degC) for about half an hour, or until they are soft. About halfway through the cooking, sprinkle over 1-2 tsp of good quality balsamic vinegar if you have some. Remove the thyme before serving. If you’re a carnivore, throw some shallots in the pan with the roast lamb or beef or chicken. A variation on French onion soup. Cook the shallots slowly with the butter and oil in the saucepan for 15 minutes. Raise heat to moderate. Cook for 30 to 40 minutes, stirring frequently, until the shallots have turned an even, deep golden brown. Sprinkle in 3 Tb white flour and stir for 3 minutes. Simmer partially covered for 30 to 40 minutes. Serve with grated gruyere cheese sprinkled over each bowl of soup, and a slice of toasted Volare sourdough bread. Optional x-factor: add a splash of brandy.